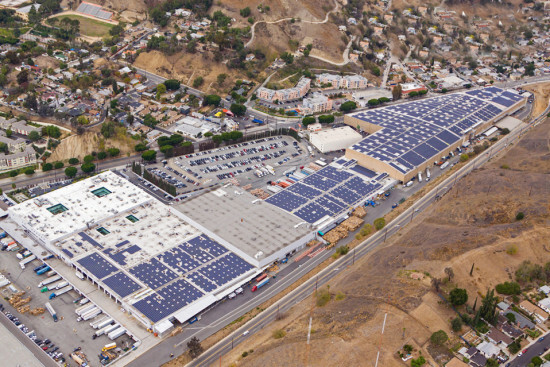 On January 21 solar supplier PermaCity and retailer Forever 21 turned on the switch to their 5.1 MegaWatt DC SunPower solar system in Los Angeles’ Lincoln Heights neighborhood. The renovation of the former Macy’s distribution center—now Forever 21’s headquarters— was designed by Forever 21 staff with Culver City architect Brian Reiff. The project consists of 15,512 SunPower modules placed on the building’s roof, using PermaCity’s SolarStrap—an aluminum and stainless steel, light-weight panel system using no ballast or penetrations. The building is now the largest solar rooftop system in Los Angeles County and the third-largest in California. The project was made possible thanks to the Los Angeles Department of Water and Power (LADWP) Feed-in-Tariff, a program launched in 2013 allowing renewable energy plants to sell their power back to the city. The solar panels on the rooftop will generate enough energy to power the equivalent of 1,450 homes, avoiding the production of almost 13 million pounds of carbon dioxide, the equivalent of taking 1,200 passenger cars off the road.